"This is as Southern as you can get." Perfect. 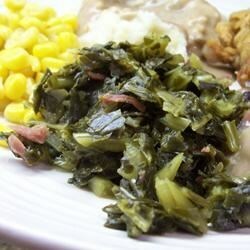 To reduce the smell of the collards while they cook, add one pecan (shelled). Seriously, it helps. These were great! I used smoked turky necks, since I don't eat pork. I also used 1/2 broth and 1/2 water. They were flavored well. I fixed some cornbread and ate them with it....SO GOOD!